Now you can cut your energy costs by 70% or more - with the motor generation of the future. The following menu items will tell you all about this technology. With the efficiency calculator or the mobile App, you can quickly and easily calculate how much you will be able to save on energy with the new KSB SuPremE®. KSB SuPremE® motors are well suited not only for use as pump drives but just as well for powering fans and other rotating equipment. We look forward to taking your call and will be happy to give you all the help you like. 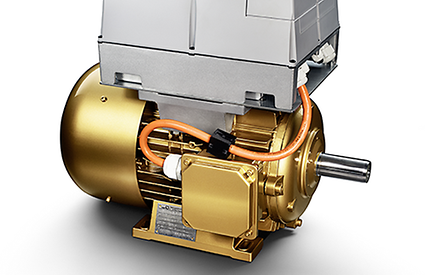 In combination with a PumpDrive speed control system, KSB SuPremE®motors save up to 70% or more. The motor alone can save up to 30%. Especially in the part-load range, KSB SuPremE® motors have major efficiency advantages over current standard speed-controlled asynchronous motors. KSB SuPremE® motors already satisfy the efficiency requirements for electric motors according to the scheduled IE4 standard pursuant to IEC (CD) 60034-30 Ed. 2. KSB SuPremE® motors have an outstandingly small total environmental footprint. Their non-use of magnetic materials makes them much more sustainable than permanent-magnet synchronous motors and asynchronous motors. Thanks to the use of non-critical, long-lasting materials, KSB SuPremE®motors are extremely robust and durable. KSB SuPremE® motors are compatible with IE2 asynchronous motors. Their patented rotor design ensures an extremely low level of torque ripple (1-2%) and accordingly quiet operation. What makes the KSB SuPremE® so efficient is an interplay of numerous technical innovations. KSB SuPremE® motors are not just extremely efficient - they are also very versatile. Consider this brief list of primary applications of KSB SuPremE®motors.